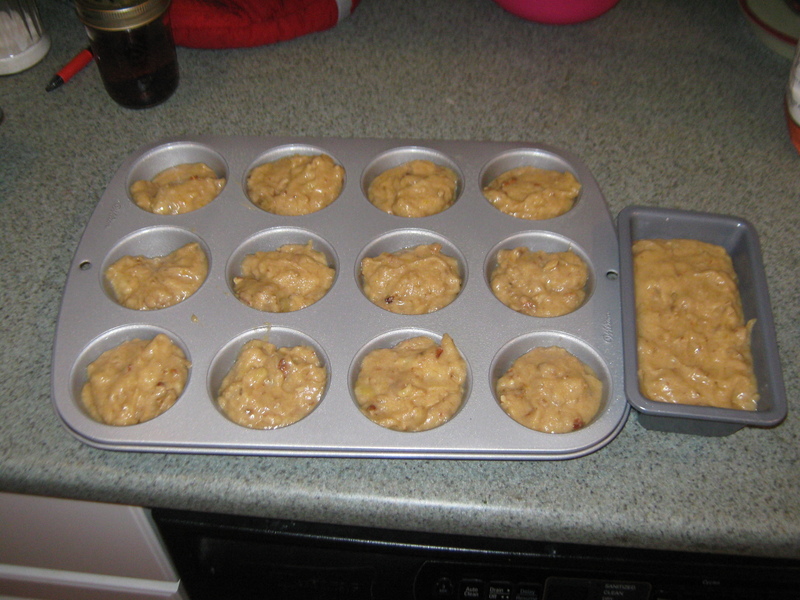 The last time I made banana muffins I was doubling the recipe and made a big goof because I did not double the sugar…. I tripled it. In the end I ended up with sugary banana pucks- not dense, just no levening. They were really good, they just gave you a cavity in the process. Well, I got bananas this past weekend for the purpose of banana muffins- I had been craving them recently. So I got out the mixer and all my ingredients tonight to get some serious banana pecan muffins going. Preheat oven to 350 degrees F and lightly grease the muffin tins . 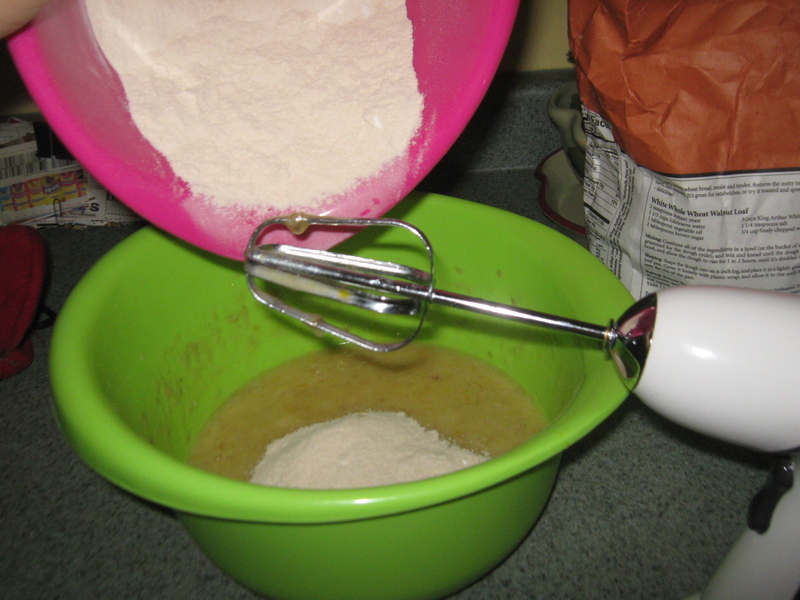 In a medium bowl, combine the flour, baking soda, and salt; set aside. In a small bowl, mash 2 of the bananas with a fork so they still have a bit of texture. 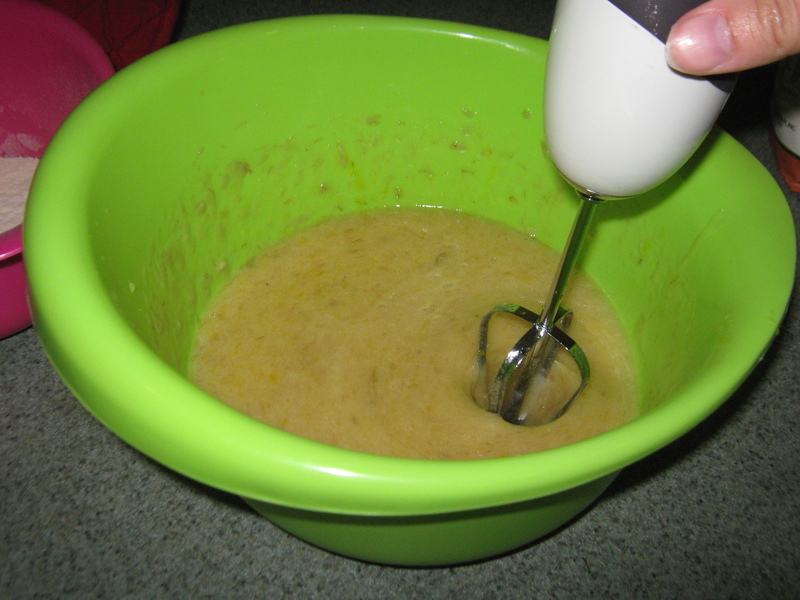 In a large bowl, beat with an electric mixer, the other 2 bananas and sugar together. You want a light and fluffy mixture, approximately 3 minutes. Add the melted butter, eggs, and vanilla; beat well. Mix in the dry ingredients just until incorporated. Fold in the nuts and the mashed bananas with a rubber spatula. Divide the batter evenly between 18 muffins. Bake for about 25 minutes, until golden brown and a toothpick inserted into the center comes out clean. You may need to rotate the pan periodically to ensure even browning. Cool the muffins in the pans for 10 minutes or so, and then turn out onto a wire rack to cool completely. I felt like mixing things up a bit and used whole wheat flour instead of all purpose flour. The muffins had the same great texture and taste but they did not rise much, compared to when I use all purpose flour. No worries, taste is more important than appearance to me. Plus I made 12 muffins and I used the rest for a mini loaf that I am going to take with us when we go camping this weekend. Adding the whole wheat flour.